If you’ve been watching the telenovela “100 Days to Heaven” (starring child star Xyriel Manabat and Coney Reyes [as Madam Anna Manalastas]), you may have seen the episode where janitor Mang Carding (played by Joonee Gamboa) talked about how Madam gave him a sermon which motivated him to learn how to read and write despite his advanced age. Some people go through life resigned to their fate. But Madam told Mang Carding that you don’t have to formally go to school if you really want to learn how to read and write. The power to shape your future is in your hands. The same thing applies to future real estate brokers. Are you worried that your IQ is not high enough for the real estate brokers’ licensure exam? Are you nervous that it’s been so long since you last studied or took exams, and that your brain might no longer be used to the rigors of concentrated study? Do your hands shake as you scratch your head and wonder when will you ever find the time to review for the exam? All these fears are in your head, and it is all too easy to look around us and blame things, even if the power to succeed clearly lies within ourselves. In that episode of “100 Days to Heaven”, Mang Carding reads out loud a letter he was hoping to present to Madam Anna while she was still alive. He reads it to the revived young Anna upon her encouragement, and we see how moved Coney Reyes was to hear and watch this man finally learn how to read and write. Even the people around the TV were sniffling because they were clearly touched by the scene. We all root for the underdog. Especially when we see that person rise up to the challenges before him. May Mang Carding inspire you to take charge of your life, know what you want, understand what it takes for you to get to where you want to be, and push yourselves to take action. And that’s why, this early, we would like to congratulate you! 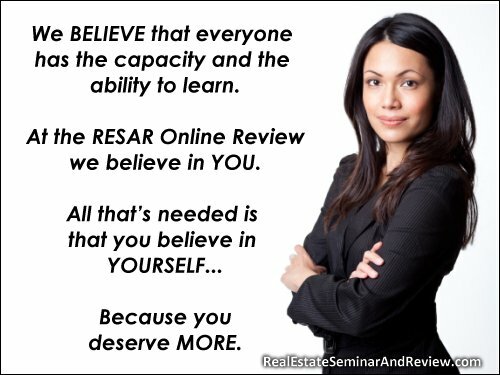 Here you are, reading this page, making the effort and taking the time to bring yourself closer to your goal of passing the REB Exam and becoming a licensed real estate broker. [From the Admin] Hi! Please join the RESAR Online Review Announcement List for details. Thanks! but would there be another one? because ive heard that there will be a course for real estate broker? There is no course yet for Real Estate Service professionals. Assuming a course is available in June 2011, the first batch of enrollees will graduate in March 2015. We don’t think the PRC will stop conducting Real Estate Brokers’ Exams between 2011 and March 2015.
is there a date for the real estate exam? would there be another exam? im also finding a broker that can help me start in this career.. along marikina cainta area..
[From the Admin] Hi! We haven’t seen any official announcement from the PRC regarding the next Real Estate Brokers’ Licensure Exams. As soon as we get official word, we will publish the information online ASAP. Thanks! Do I need to have experience in real state to be qualified for taking an exam? [From the Admin] You basically need a college diploma, plus 120 units in real estate subjects. May we know which exam you are interested in? Is it Real Estate Brokers, Appraisers, or Consultants? would there be still real estate broker’s exam for this year? if so, when? [From the Admin] Hi! We haven’t seen any official announcement from the PRC regarding the upcoming Real Estate Brokers’ Licensure Exams. We heard rumors about a November 2011 exam. Later, people were saying it will be in January 2012. But to emphasize: We have not seen an official announcement from the PRC. [From the Admin] Hi! Aside from a college diploma, you also need to earn 120 units of real estate subjects. You can do this by enrolling in a 120-hour face-to-face Comprehensive Real Estate Seminar and Review (CRESAR). [From the Admin] Hello! You need to have a College Diploma before you will be issued an Examination Permit by the PRC for the REB Exam. If your Certificate for the 24 units of CPE states that it is in preparation for the REB Exam, then yes, that can form part of the required 120 units. If, however, the CPE is for Real Estate Salesperson accreditation by the PRC, then the certificate may not be used for the purpose of earning the “120 units of real estate subjects” needed prior to taking the REB Exam.